I went to Bristol at the weekend for my best friend's birthday and decided to don some falsies for the occasion! All previous solo attempts at applying fake eyelashes have failed spectacularly but having bought Duo Eyelash Adhesive when I dressed up as Mini Mouse I figured I'd have another go. Turns out Duo really is the answer. I picked up some £1.99 lashes by Perfect Girl from Savers in 'natural flirt'. How very apt. 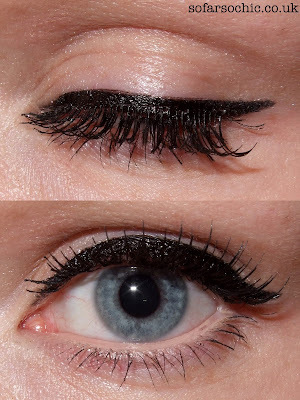 For my favourite winged liner look I applied Eyeko Graffiti Eyeliner in jet black. What an awesome felt tip liner! Super easy to use and gives a long-lasting inky black line. My new fave. To give some definition to my blondie brows I used Prestige BrowPerfection in light/medium. I bought this marbelised brow pencil in the US but it will be available in UK Boots stores from spring 2011. 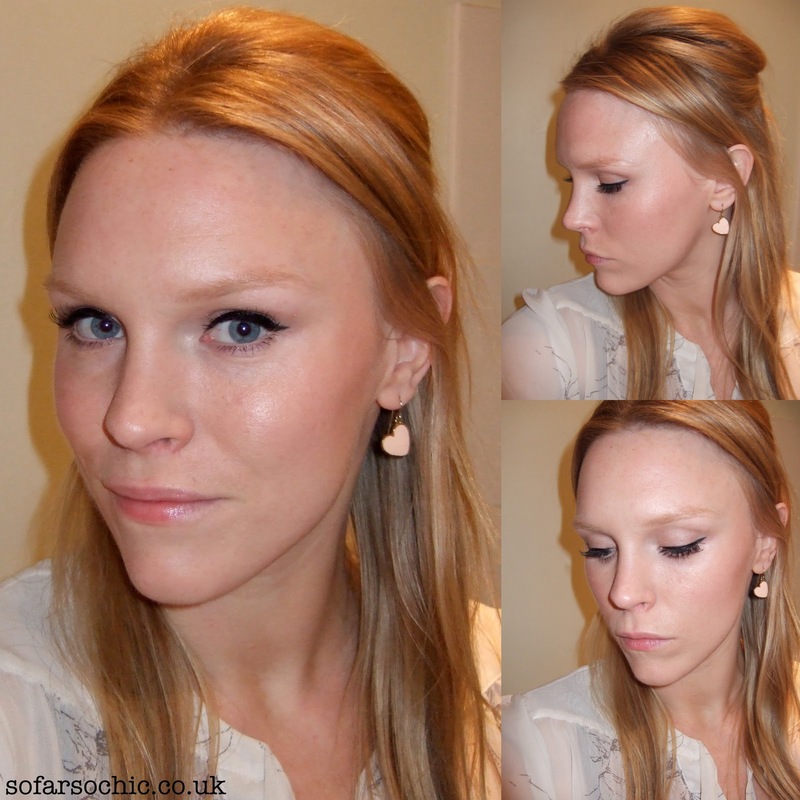 It's the perfect ash blonde colour; hard enough not to apply too heavily but easily buildable. It also has a handy mascara-style brush on the end for combing through brows. $5.99 versus however much for the Laura Mercier version I almost picked up in Sephora. Cue smug face. I used my new Sleek Blush in rose gold on my cheeks, which gave a pretty peachy glow. I'm impressed with the fine texture of the powder and how subtle the shimmer is. Lots of other makeup besides, including Chanticaille Brilliant Gloss in sweet on lips (I later added some MAC lipstick in Vegas Volt – a gift – in case you were thinking I'd broken my boycott), Shu Uemura Cover Crayon on my waterline, Chanel Bronze Universal as a cheek contour, backcombed hair, and earrings from Forever 21 in New York. What do you reckon then guys? It's frustrating how much photos bleach out my makeup because I'm so pale but hopefully you get the gist. Gorgeous! I really need to master falsies. I love this look on you... very polished! And well done on the false eyelashes - you've applied them perfectly! Fabulous. It looks as if a pro did this for you. Where did you get Duo Eyelash Adhesive. I've had problems trying to stick eyelashes this summer with the glue supplied. Made a right old mess! Thank you ladies. @Fierce I got it from Beauty Bay as I was also getting some Zen Tan but I expect you can get it cheaper than the £7.95 I paid (plus postage). Lashes look good - i gave up. Never got them to stick and had visions of a bridget jones moment of them falling into my plate. Your skin looks glowing though - how did you do that? Ah I see, well the result is beautiful. Love the peachy colours too - very warm and fresh. I love this look on you. You are very skilled with that liner, no matter how hard I try I always go wonky on one eye. The blusher looks gorgeous too, I picked this up at the weekend for someone and I'm so pleased to hear you rate it. Very nice, I hope you had a good time?